PhET simulations are free interactive simulations that provide students an open-ended space to play with and explore mathematical concepts from place value to calculus. Teachers can guide students toward specific learning goals by combining simulation exploration with a guided activity and facilitating student discussions. Learn how to design and facilitate sim-based lessons that engage your students and encourage conceptual understanding. This session will focus primarily on pre-algebra and algebra topics, but will be useful for any teachers new to PhET. 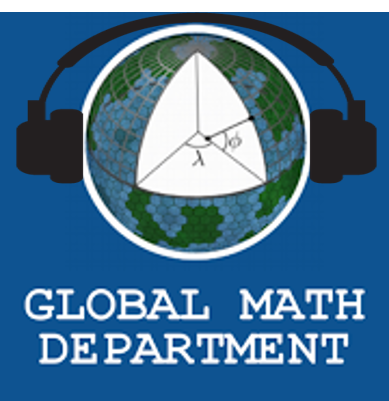 You can always check out past and upcoming Global Math Department webinars. Click here for the archives or get the webinars in podcast form! Mathematics is often touted as the ‘human universal’, a subject that does not discriminate on the basis of race, gender, nationality, or sexuality. If only that were true. The harsh reality is that mathematics is done by people, people create institutions, and institutions reproduce structural inequities. Universities are not immune to the reproduction of structural racism and sexism, despite their pride as institutions of intellectual freedom and liberalism. Hence Amy Harmon’s recent piece in the NYTimes, For a Black Mathematician, What It’s Like to Be the ‘Only One’, is a timely reminder that it can be difficult to be a black mathematician in a community of predominantly white and Asian peers. The piece centers Edray Goins, currently a professor at Pomona College, who wrote an AMS blog post in 2017 explaining why he left a research position at Purdue University. In his piece, he talks about the lack of priority given to teaching at research-oriented universities, the social isolation of research, and the isolation of being only one of two black faculty in the entire College of Science. Black Americans receive about 7% of doctoral degrees across all disciplines but only 1% of doctoral degrees in math. There are 1,769 tenured mathematicians in the 50 U.S. universities producing the most math PhDs. Probably, 13 of them are black. In addition to the social costs of the dearth in black mathematicians (which I feel is the most important factor to consider), there is a significant economic impact from the mathematical community’s lack of diversity. It is important to consider that math research receives large funds from our own tax dollars through federal grants. The idea that there are few black mathematicians because they are not as intelligent is simply circular. The lack of black representation leads to bias and assumptions about the abilities of black mathematicians, which in turn create obstacles to enter the field. In 1969, the leadership of the nearly all-white American Mathematical Society told members to reject a resolution to address the shortage of black and Hispanic mathematicians in the community. My take on this is that the AMS has a responsibility to take decisive action in redressing the historical discrimination placed upon black and Hispanic mathematicians, whether it is through a more active role in advocacy, an increase in publications that feature black and Hispanic mathematicians, or increased coordination with the K-12 community in ensuring that black and Hispanic students do not give up on the field in elementary, middle, or high school. On February 23rd, Peter Liljedahl gave the Margaret Sinclair Memorial Lecture, on his receipt of the award in her honour, at the Fields Institute at the University of Toronto. Peter’s thinking classrooms research has been developed and refined over the last 15 years, and this lecture was a short review of things he has learned. Chances are, if you are reading this newsletter, you are aware of this research. For many teachers, particularly secondary, this research has changed practices, and changed lives. Dave Lanovaz also presented on group testing: The simple, effective tweak he came to use was adding in a review day before the group test. Thinking classrooms have now been presented 276 times, in 8 countries, and are used in subjects as disparate as Home Economics. 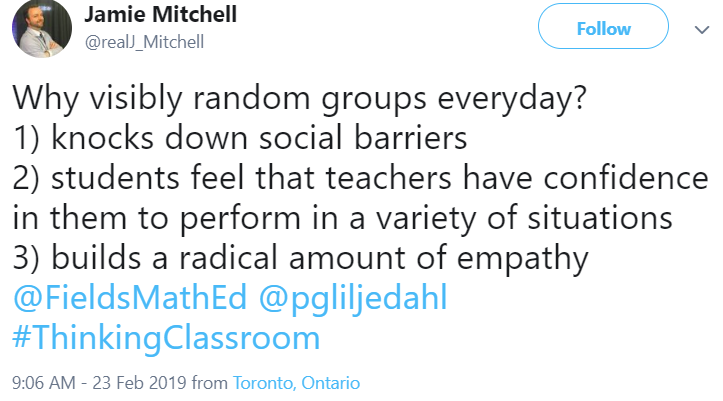 Liljedahl described the “exponential growth” of thinking classrooms. Basically, they suddenly were talked about everywhere, after a lengthy quiet period, from 2012 to 2014. This quiet period coincided with research into the conditions that make thinking classrooms in hundreds of individual classrooms. Vertical non-permanent surfaces are surely the most famous aspect of this research. Visibly random groupings is another. Liljedahl has described his research as “mucking about”. The original paper he put out is here. This research continues to evolve, and is, in my opinion, a model for good educational research-large scale, exploratory and open-minded, and thorough. The math classroom can easily be turned into a class where students wish they were robots: just memorize formulas, theorems, and definitions, and “plug and chug.” How do we bring back the human aspect of math? How do we show that we value our students’ voices? 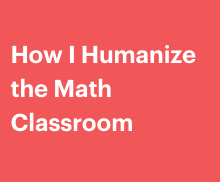 In this session, I will share many pedagogical strategies that you can start using in your classroom next week that humanize your math classroom, making your students feel that they are more than their ID number. To join this meeting tonight when it starts at 9pm Eastern (or RSVP if it’s before 9pm), click here. Math belongs to all of us. Anyone can be a mathematician. Unfortunately, many faces in history go unacknowledged and what we are learning in the math classroom can be biased. For example, a quick Google search can tell us that even though we call it “Pascal’s Triangle,” the Chinese created this triangle centuries earlier, calling it “Yang Hui’s Triangle” but we do not acknowledge that in American classrooms. As math teachers, It is our job to do some research and see whose voice we are leaving out in our math classroom. What I love about @DrKChilds is that he is educating us about a black mathematician for Black History Month. We can only grow and get better by learning and acknowledging contributions that we might not have known about. @MrKitMath printed the posts out to share with his students. If we want a diversity of our students to imagine themselves as mathematicians, we must show our students that math is filled with a diverse field of mathematicians. It’s hard to get students to realize when they don’t understand something or when they are confused about new material. Finding a way to get inside a student’s head can be challenging for any teacher. The strategy of asking students “what questions do you have?” has led to some success, at least more success than “any questions?” that we used to all ask. Hello Math Nerds! 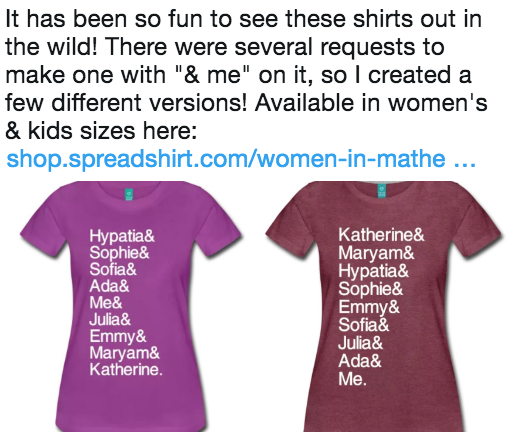 If you dig Howie’s post, you might enjoy Chrissy Newell’s (@MrsNewell22) project of inspiring girls (and all of us) by focusing on the valuable, and largely unrecognized, roles that women have played in the field of mathematics. Click on this link to find out more information. As a man, I’m proud to wear my shirt and have learned more about my own biases and blindspots by researching the phenomenal accomplishments and courageous lives these women gave to humanity. Also, did you know that our own Howie Hua is giving the webinar this week? Check it out! I’ve heard Howie talk about some of these ideas in person. He’s an inspiring speaker, and I think your time is well spent listening to what he has to say as an presenter. Stay nerdy my friends! Got something you think should go into the GMD Newsletter, hit my up on Twitter at @mathgeek76. Do you have 100% of your students completing your homework? Are students in your classes routinely using your homework assignments as learning tools? Yes? Then this session is not for you!!! This session is designed to challenge your views on HW, and help you utilize research based HW strategies. Learning mathematics for students requires a lot of diverse materials : notes, pictures, graphs, interactives, worksheets, equations, feedback, review materials. How do they have a workflow that works for all these different media; how do they collect, manage and cope while at the same time meeting with accessibility & language needs? And how do teachers manage to deal with all of that along with the need to do assessments, give feedback, observe, reflect and just “teach”? We’ll go through how #digitalink & OneNote have made all of this manageable and has in fact increased learning time in the classroom while adapting to the desire to engage in discussions, #vnps, student voice/choice, visualization and other common practices of the modern classroom. 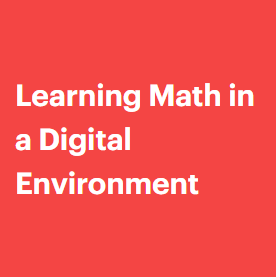 Last week Cal Armstrong presented the webinar, Learning Math in a Digital Environment. If you missed it, make sure to catch the recording! Don’t forget – recordings for all previously held webinars can be found here. Desmos just added statistics features to its already amazing free online graphing calculator. Dot plots, box plots, histograms, distributions and t-tests are all now available. This is great news for teachers who teach one variable statistics and data displays. And while we’re talking about Desmos, don’t forget that the application for the fourth year of the Desmos fellowship are now open. This amazing professional development opportunity is open to teachers across the US and Canada. If you want to hear more about the fellowship weekend, check out the recent Des-blog featuring past participants experiences. Homework: a Problem or a Solution? Do many of your students struggle to complete math homework? Recently, Julie Reulbach blogged about Meaningful Homework and CPM. She doesn’t grade homework anymore, but she does check for completion. The CPM curriculum she uses has homework that includes spiral review. 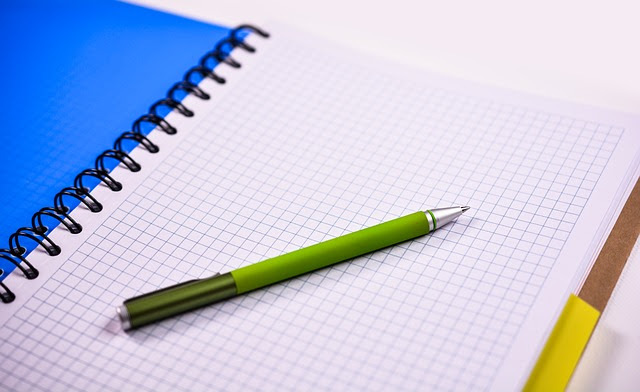 Julie has made some purposeful decisions about the quantity and timing of homework where her “students absolutely love the new system.” Read her blog post to learn what steps she took to increase the completion rate and connection to student learning. In next week’s webinar Frank Wapole and Evan Borkowski will be here to challenge us to rethink Math homework. You can get more info on the session and register here. In recent weeks, the media has been abuzz with talk of tax rates. Most visible has been the headlines surrounding Rep. Alexandria Ocasio-Cortez’s talk of increasing the top marginal tax rate to 70%. This news has sparked much debate from all sides of the political spectrum. But regardless of your political beliefs, it’s been illuminating to witness the conversations and, in some cases, misunderstandings surrounding the system of income taxation in the United States. So what’s this got to do with the math ed community? Well, if there was ever a moment for us to shine, this is it! First up, Dan Meyer has written a blog post with some ideas and resources for helping our students understand marginal taxation. Dan also mentions an amazing collaboration between the New York Times Learning Network and the American Statistical Association called What’s Going on in This Graph? and, even better, Desmos teacher activities that enable teachers to have these conversations through the Desmos platform. Second, Ben Orlin includes talk of taxes in his critically acclaimed book Math with Bad Drawings. As Ben mentioned on Twitter, the chapter stemmed from a “make your own income tax system” project that he used to give to his precalculus students. He also points out that, interestingly, marginal tax rates are a piecewise-constant function of income while tax paid is a continuous, piecewise linear function. Third, @voxdotcom came out with a fairly well-made video explaining how tax brackets work. It may be interesting to connect the visual representation of tax brackets as “pockets” with the algebraic concept and notation of piecewise functions. I was particularly impressed by the fact that the video also mentions deductions, a concept often overlooked when people talk about income taxes in the United States. Ultimately, what’s at stake is not just our students’ mechanical understanding of marginal tax rates. Rather, this is about the aspect of our work as teachers that involves helping our students develop mathematical literacy. In Paulo Freire’s words, before we teach our children to read and write, we must teach them to “read and write the world.” Beyond focusing on high test scores and college acceptances, we must help our students approach the complexities of the world with an array of intellectual tools. We must also help them develop the social and political sensitivities to use those tools with wisdom, agency, and compassion. Black History Month, is a time to celebrate and amplify Black voices, stories, shed light on injustices, and teach. Look at this article Teaching Black History Month from Tolerance.Org for inspiration and lessons. Finally, if you are teaching about Math History check out Mathematically Gifted and Black. Try this: close your eyes, and think of an open number line. You just need to picture a line, no intervals marked, just a certain amount of space. That line will have a length, although it is difficult to tell how long your mental image of this line is. We know this line could stretch from some starting point, to infinity, or rather to some infinite length, which we cannot measure. We could mark an infinite number of points on this line, and actually, we could mark two different types of infinity on this line: counting numbers, and real numbers, which are demonstrably at a higher level on the “tower of infinity”. Close your eyes, and picture a line of length 10 units. Hold up your hands however long you think that line should be. Now open them. Where are your hands? Try the same exercise for 20. Where are your hands? Here is an interesting tweet thread about some experiences I had working on number lines with grade ones. My colleague asked them to visualize 20. Consider trying this with your students. Whether “shoulder width” is a preferred human length for number lines is an open question. Perhaps “body scale” is most relatble to us humans. If you want to blow their minds, ask them to draw an open line of some length, mark 0 and one million as the ends. Where is 1000? Now do the same for one billion. Where is one million? Space and number are mysteriously connected. As I understand the research, we know they are connected, there is no doubt, we just don’t really know how. Work is being done in this area. See the pre-print in this tweet below, and consider reading it. Zach Hawes and Daniel Ansari are working on what happens in the brain to connect space and number. Basically, there is an emerging body of evidence that spatial reasoning and thinking about numbers are connected, as shown by fMRI mapping of the regions of the brain responsible for each. Research continues, seeking to find this “missing link”. In the meantime, an open number line is a tool “with legs” in grade 1-12 education. (Typically, Kindergarten students aren’t quite ready to go past concrete counting objects, ten frames, and on to the number line).